On this date in 1944, Italy’s fascist rump government shot its former naval commander in Parma. Inigo Campioni (English Wikipedia page | Italian) was both a Senator and the Admiral in charge of Italy’s main battle fleet when war came in 1940. Knocked for overcaution during a few engagements with the British, he was relieved of his leading command position by the end of that year. Come September 1943, he was at the island of Rhodes when Italy agreed to an armistice with the Allies. This was actually quite an unlucky spot to be, since the Germans, anticipating this development, had prepared a lightning Dodecanese Campaign to seize Italy’s positions in the Greek islands. Many Italians resisted the German incursion, and suffered some of the war’s more infamous massacres for their trouble. 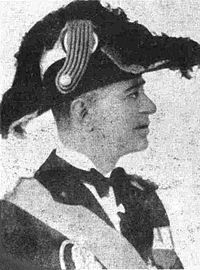 Campioni, who likewise recognized the government that signed the armistice, was captured within three days. Unlike those recalcitrant Italians who met a summary fate, the admiral’s stature made him worth the trouble of trying to persuade. He was shipped first to a camp in Poland then to a prison in the northern Italian fascist statelet still headed by his former boss, Mussolini. Campioni just kept refusing to recognize this Italian Social Republic: even to the end, he had a reprieve from shooting on offer for the price of an expedient word. For never speaking that word, and instead suffering the fusillade with fellow-admiral Luigi Mascherpa, Admiral Campioni has been well-honored in posterity.